Tested 10k. The diamonds are VS/SI clarity, H color and have wonderful sparkle. .15cttw., SI in Clarity and H in Color, Circa 1950's. Stamped 14K. Wide 12mm. 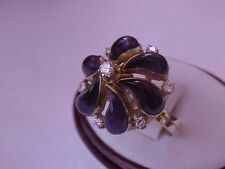 Art Deco 18k Yellow Gold Ring:1.00ct Diamonds & Amethyst Ring Amazing!!! Tested 18K. 1.00 cttw., SI in Clarity and H in Color. Looking for a high end pearl necklace with dynamite looks?. They are very well matched and hand knotted. The ends are bound with French wire. They have heavy nacre and a cream rose orient with high luster. Both bracelet bridal cable characters. Chain is 17.5" with a 2" extension. Lead and nickel safe. NOTE: We cannot customize products. No podemos personalizar productos. 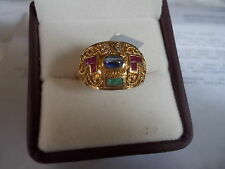 18k Gold Ring 1.49 cwt Multi Precious Gemstones and Diamonds Size 7.5 IGI CERT. This Multi Precious Gemstone Ring was given to my Fiancé by her Grandmother from her Mother. I do not have any real history other than that. Ring Size 6.5 - Sizable. Ring Weight. This ring is in excellent pre-owned condition. Collectors Coins & Jewelry has been family owned and operated on Long Island, NY since 1946. Check out our large selection of aggressively priced jewelry, watches and coins. Featuring a set of 14K gold-dipped initial necklaces in a beautiful, polished finish. An atmosphere of pride and creativity at every level contributes to 1928's continued success. both bracelet bridal cable characters. This is a STUNNING ESTATE RING that was HANDMADE in the ART DECO style from PLATINUM. The ring sits just over 3/16” high off the finger and the ring size is a 6 ½ - ¾. The total weight is 2.7 grams. From the 1950s. The mounting is solid 18kt yellow and white gold. Features: Color: Antique silver color Silver is good to human health. Adjustable Ring Size: About 7. Can be adjusted slightly（5-8）. Lightweight and comfortable to wear. Incredible works of Art, Platinum Diamond Filigree Ring. 1 Brilliant Cut. 59ct Diamond (color "F";clarity "VS"), decorated with 22 "round cut" Diamonds (estim. Weight 4.7Gr. Hallmarked Plat. ). Stamped 14K. 22 brilliant cut diamonds, SI in Clarity and H in Color estim. Both bracelet bridal cable characters. CHAIN LENGTH - 45cm 6cm. NOTE: We cannot customize products. Both bracelet bridal cable characters. NOTE: We cannot customize products. No podemos personalizar productos. With a loyal following - collectors continue to seek out early, original pieces. Center Stone : One Cultured 15.5 mm Tahitian Pearl. Diamond Wt : 1.72 Cts As per (IGI Cert). IGI Appraisal Report # 7027342A. IGI Appraisal Report Date 05/20/2004. Side Stones : Diamonds. Diamonds Clarity : Vs 2 - Si 1. The total gem weight is 2.28cttgw. Center Diamond.48ct Round Diamond IGI Certificate 42011006xx With Accents. I feel IGI went very strict on the grade. Like stricter than GIA. Ring has Hand Engraved. Ring Size: 4.75us. Graduation Gift for Daughter Wedding Gift Teen Girls Cuff Bangle Bracelet Always My Daughter Forever My Friend. Read: Always my daughter forever my friend. brass and copper materials cuff easy Oxidized and turn your wrist green or black. PLATINUM 10.9 gr. LUXURIOUS RING. THIS RING WOULD BE THE BEST PRESENT FOR YOUR LOVED ONE! Side stones are 0.76 ct., I color, SI1 clarity. FEATURES - Vivid colors & Clear image. NO FADING - No dyes harming health of your family. We PROMISE we can make you happy if you give us a fair chance. MODERN PRINTS - Printed with state of the art digital printing technology. Jewish 12 Tribes Gold Filled Charm Bracelet Antique Silver/Gold Religious Spupernatural Talisman Amulet Jewelry (Colorful). Patten:12 Tribes,Charm size about:20 26mm(0.78 1.02"),weight about 10.3g. Made of high quality - alloy, eco-friendly made, free of nickle and lead. Round Brilliant Cut. Classic Solitaire Setting containing (4) Invisible Diamonds. Carat Total Wt. Band Width. White Gold. Mounting Style. Color, Clarity. All inquiries are Quick, Secure, & Confidential. These are all natural H1-11 diamonds in a size 7. This is a solid rose gold ring all the way through and made very strong.This is a size 7. This diamond and this ring where made for each other, what a beautiful combination of brilliance and classic elegance. The way the ring is designed makes the stone look even bigger. This way no one can switch your diamond on you in the future without you knowing. The stone is really well cut with excellent eye clean clarity, SI1, very bright. The paperwork includes the IGI report and appraisal below. Unheated sapphires represent a small fraction of all sapphires on the market and few of those have the paperwork from a leading lab to back it up. The 100% Natural Untreated 1.16 carat Oval Cut Intense Blood Red Ruby in this ring presents as a magnificent rich stone. W hat a beautiful combination of Killer Rich color and Bright Clean Transparency. The stone has been certified by EGL/UGS and IGI to be unheated and untreated. The stone is very bright and transparent with absolute eye clean clarity. There is a slight greenish overtone to the stone but the dominant color is blue as shown in the images. Main Center Stone Shape --> Brilliant Round cut (1.5 ct.). Gem Type --> Simulated Diamonds. Country of Manufacture --> India. Ring Size --> 7 (FREE sizing is available. Double your traffic. Total Carat Weight (TCW) --> 2.45 Carat. ). The centre stone – certified by IGI as K colour, VVS2 clarity – is internally clean and incredibly lively. A slim, white gold shank is set with a pair of high white baguette cut diamonds in the shoulders. Designer 18 K solid white gold butterfly design ring with VVS FG quality Diamonds. Beautiful one of type collection piece. Weight -5.120 grams, Diamond weight-0.43 carat, Diamond quality -VVS FG (IGI CERTIFIED), width-1.4 cm, usa ring size-7.5 ( we can adjust to any size). NATURAL 14.10 CT. NATURAL TOURMALINE = 14.10 CTS. IN 18K WHITE GOLD. 18K WHITE GOLD = 15.770 GRAMS. His confusion lived on until scientists recognized tourmaline as a distinct mineral species in the 1800s. Designer 18 K solid white gold pendant/brooch set with VVS FG quality Diamonds. Beautiful one of type collection piece. Weight -11.500 grams, Diamond weight-1.58 carat, Diamond quality -VVS FG (IGI CERTIFIED), size -4.5 cm. 18 k solid gold Diamond floral pendant. Designer 18 K solid white gold ring with VVS FG quality Diamonds. Beautiful one of type collection piece. Weight -6.390 grams, Diamond weight-1.09 carat, Diamond quality -VVS FG (IGI CERTIFIED), size of top-2 cm, usa ring size-8.5 ( we can adjust to any size). Designer 18 K solid yellow gold Ring set with VVS FG quality Diamonds and natural Red Coral. Beautiful one of type collection piece. Coral weight-8.15 carats, gold Weight -6.280 grams, Diamond weight-0.68 carats, Diamond quality -VVS FG (IGI CERTIFIED), size of top-30/7 mm. Designer 18 K solid white gold pendant/brooch set with VVS FG quality Diamonds. Beautiful one of type collection piece. Diamond quality -VVS FG (IGI CERTIFIED), size -4.5/3 cm. 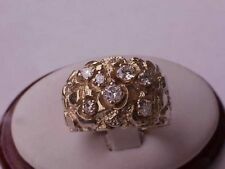 IGI Certified White Gold and Champagne and Fancy Color Diamonds Ring Size 6-. Information regarding item(s) listed is supplied to Gold and Silver Brokers by prior owners; however, the information is researched or verified by Gold and Silver Brokers to the best of our abilities. 100% handmade 1920s pearls necklace: long knot pearl necklace 49" 2 59" pearl necklace 1. Material: High quality imitation pearls. Color: A-Knot Pearl Necklace 2 59" Necklace 1. No months-long wait from overseas! Ring size is 6-3/4, and weighs 10 grams of 14k white gold, 6 smaller diamonds surround the center and grade SI1-2-G totaling apx.75 ctw alone, Center diamond faces up clean and clear and brilliant white, The grade is set by an imperfection under the table that is hard to see with the naked eye.